Thomas Sorensen saved debutant Massimo Luongo's spot-kick to give Stoke a 7-6 shoot-out win over Tottenham in the third round of the Carling Cup. 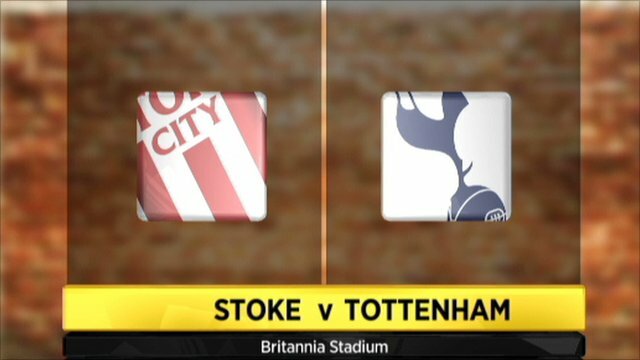 Robert Huth headed Stoke's best first-half chance over before Tommy Carroll volleyed off-target for the visitors. An evenly matched second half led to the game remaining goalless at the end of 90 minutes. Jon Walters missed when one-on-one with Spurs keeper Heurelho Gomes in extra time before the drama of penalties. Gomes looked shaky again, although he did not have a lot to do before the shoot-out, during which he was repeatedly sent the wrong way. Both teams came into the game after 4-0 results on Sunday - Tottenham thumped Liverpool, but Stoke were beaten by Sunderland. Home manager Tony Pulis made seven changes while visiting boss Harry Redknapp made nine. Stoke's Wilson Palacios started against his former club, but was substituted soon after the hour mark following a disappointing display. Fellow former Spurs player Peter Crouch came on in the 12th minute to replace Kenwyne Jones, who was forced off with an ankle injury, and the England striker gave a better showing than Palacios. Jones had looked good up front alongside Cameron Jerome in a positive start by Stoke, but Tottenham had the only early sight of goal as Rafael van der Vaart had a free-kick blocked. Stand-in Stoke captain Robert Huth headed over a Matthew Etherington corner, but chances were scarce as the rain poured down. Spurs finished the first half well though, as Sandro's 25-yard shot was saved by Sorensen before Carroll volleyed over after Roman Pavlyuchenko's cross from the right. The visitors also started the second half strongly as Van der Vaart shot wide then Livermore did the same. Pavlyuchenko's 20-yard hit was pushed over by Sorensen and another Van der Vaart free-kick came close as Spurs' strong spell continued. Etherington then put in a cross that troubled Spurs close to the hour mark, as Gomes flapped at the ball under pressure from Crouch, but Sandro - sporting blue highlights in his hair - cleared acrobatically. A Jermaine Pennant free-kick was deflected over the top as Stoke continued to fight back. Jermain Defoe had a near miss with a long-range strike shortly after he came on for Van der Vaart. At the other end, Crouch continued to cause problems as the game looked like it could go either way in the final stages. There was an unusual incident in the 87th-minute when Livermore, injured off the pitch, crawled back on to try to halt play before Jon Walters hauled him off. Huth shot from the edge of the box early in extra time and Gomes spilled the ball then re-gathered before Crouch could pounce. The hosts missed an even better chance when Walters shot wide when one-on-one with the Spurs goalkeeper. The teams naturally looked tired in the second period of extra time, creating few openings, in a low-key end to a poor-quality match. In the penalty shoot-out, Walters and Defoe both scored first up for their sides. Pennant hit the bar but Pavlyuchenko also blazed over. All the following penalties were then successful up to 7-6, when Stoke's Danish goalkeeper saved from Luongo. 128:45 A save by Thomas Sorensen from penalty by Massimo Luongo. 128:19 Ryan Shotton scores a penalty. Stoke 7-6 Tottenham on penalties. 127:46 Thomas Carroll scores a penalty. Stoke 6-6 Tottenham on penalties. 127:11 Penalty scored by Matthew Upson. Stoke 6-5 Tottenham on penalties. 126:27 Penalty scored by Jake Livermore. Stoke 5-5 Tottenham on penalties. 125:55 Matthew Etherington scores a penalty. Stoke 5-4 Tottenham on penalties. 125:19 Younes Kaboul scores a penalty. Stoke 4-4 Tottenham on penalties. 124:49 Penalty scored by Peter Crouch. Stoke 4-3 Tottenham on penalties. 123:59 Penalty scored by Vedran Corluka. Stoke 3-3 Tottenham on penalties. 123:30 Penalty scored by Marc Wilson. Stoke 3-2 Tottenham on penalties. 123:01 Andros Townsend scores a penalty. Stoke 2-2 Tottenham on penalties. 122:29 Glenn Whelan scores a penalty. Stoke 2-1 Tottenham on penalties. 122:01 Spot kick missed by Roman Pavlyuchenko. 121:20 Spot kick missed by Jermaine Pennant. 120:36 Jermain Defoe scores a penalty. Stoke 1-1 Tottenham on penalties. 120:01 All is set for the penalty shoot-out to start. 120:01 Penalty scored by Jonathan Walters. Stoke 1-0 Tottenham on penalties. 120:00+1:03 The match is going to penalties. 120:00+0:01 Shot from just outside the box by Matthew Etherington goes over the crossbar. 118:45 Unfair challenge on Peter Crouch by Sebastien Bassong results in a free kick. Jermaine Pennant crosses the ball in from the free kick, clearance by Vedran Corluka. 117:26 Centre by Jermaine Pennant, save by Heurelho Gomes. 114:04 Ryan Shotton crosses the ball. 112:56 Free kick awarded for an unfair challenge on Andros Townsend by Jermaine Pennant. Thomas Carroll takes the free kick. 112:23 A cross is delivered by Andros Townsend, Matthew Upson manages to make a clearance. 111:30 Jermaine Pennant takes a inswinging corner. 110:53 Benoit Assou-Ekotto concedes a free kick for a foul on Jonathan Walters. Jermaine Pennant delivers the ball from the free kick right-footed from right wing, clearance by Younes Kaboul. 109:53 Benoit Assou-Ekotto gives away a free kick for an unfair challenge on Peter Crouch. Glenn Whelan takes the direct free kick. 108:00 The ball is delivered by Marc Wilson, Younes Kaboul manages to make a clearance. 106:03 Thomas Carroll has an effort at goal from just outside the box which goes wide of the left-hand upright. 105:08 Jonathan Walters produces a cross, save made by Heurelho Gomes. Correction - 104:23 Jonathan Walters produces a right-footed shot from deep inside the penalty box which goes wide of the left-hand upright. 104:23 Shot by Jonathan Walters from deep inside the penalty area misses to the right of the target. 103:47 Free kick awarded for an unfair challenge on Matthew Etherington by Thomas Carroll. Matthew Etherington restarts play with the free kick. 102:50 Inswinging corner taken by Jermaine Pennant, clearance made by Younes Kaboul. 99:32 Unfair challenge on Andros Townsend by Matthew Upson results in a free kick. The free kick is delivered left-footed by Thomas Carroll from left wing. 96:32 The ball is sent over by Roman Pavlyuchenko. 95:45 Substitution Andros Townsend replaces Dos Santos Giovani. 94:25 Jonathan Walters takes a shot. Save by Heurelho Gomes. 93:03 Matthew Etherington takes the inswinging corner, Shot by Glenn Whelan from 25 yards. Save by Heurelho Gomes. 90:00+3:45 The match has reached the end of normal time. 90:00+2:44 The ball is swung over by Jermaine Pennant. 90:00+1:35 The ball is delivered by Marc Wilson, save by Heurelho Gomes. 90:00+0:08 Inswinging corner taken from the right by-line by Matthew Etherington, save made by Heurelho Gomes. 88:59 The ball is delivered by Jermaine Pennant, Younes Kaboul makes a clearance. 85:30 Corner taken right-footed by Jermaine Pennant from the right by-line to the near post, clearance made by Benoit Assou-Ekotto. 84:29 Dos Santos Giovani crosses the ball, clearance made by Matthew Upson. 82:26 The referee gives a free kick against Jermaine Pennant for handball. Heurelho Gomes restarts play with the free kick. 81:54 Ryan Shotton crosses the ball, clearance made by Younes Kaboul. 80:57 Handball decision goes against Dos Santos Giovani. Salif Diao restarts play with the free kick. 79:03 The referee blows for offside against Roman Pavlyuchenko. Indirect free kick taken by Marc Wilson. 77:55 Benoit Assou-Ekotto gives away a free kick for an unfair challenge on Jermaine Pennant. Matthew Upson takes the direct free kick. 74:20 Unfair challenge on Vedran Corluka by Marc Wilson results in a free kick. Free kick taken by Heurelho Gomes. 73:43 Substitution Jonathan Walters is brought on as a substitute for Cameron Jerome. 71:34 Jermaine Pennant fouled by Benoit Assou-Ekotto, the ref awards a free kick. Free kick crossed left-footed by Matthew Etherington, save by Heurelho Gomes. 70:03 Dos Santos Giovani takes the direct free kick. 70:03 Substitution Massimo Luongo on for Raniere Sandro. 70:03 Booking Booking for Robert Huth. 69:57 Robert Huth concedes a free kick for a foul on Roman Pavlyuchenko. 69:22 The ball is delivered by Matthew Etherington, Younes Kaboul makes a clearance. 67:23 Shot from 35 yards by Jermain Defoe missed to the right of the net. 66:51 Headed effort from deep inside the area by Peter Crouch misses to the right of the target. 66:23 Jermaine Pennant takes a inswinging corner from the left by-line to the near post, clearance made by Roman Pavlyuchenko. 66:03 Jermaine Pennant has a drilled shot. Blocked by Younes Kaboul. 64:55 Free kick taken by Glenn Whelan. 64:55 Substitution Salif Diao replaces Wilson Palacios. 64:55 Booking Jake Livermore is cautioned. 64:46 Jake Livermore concedes a free kick for a foul on Cameron Jerome. 62:14 Substitution Rafael Van der Vaart goes off and Jermain Defoe comes on. 60:00 The ball is swung over by Matthew Etherington, save made by Heurelho Gomes. 58:09 The referee blows for offside. Thomas Sorensen restarts play with the free kick. 58:00 Roman Pavlyuchenko takes a short corner. 57:28 Thomas Carroll takes a shot. Robert Huth gets a block in. 55:18 Free kick awarded for a foul by Robert Huth on Rafael Van der Vaart. Rafael Van der Vaart has an effort direct from the free kick. 54:00 The assistant referee signals for offside against Dos Santos Giovani. Thomas Sorensen takes the indirect free kick. 52:56 Thomas Carroll has an effort at goal from just outside the penalty box which goes wide of the left-hand post. 52:45 Rafael Van der Vaart takes a short corner. 52:25 Roman Pavlyuchenko has an effort at goal from 25 yards. Save by Thomas Sorensen. 49:11 Robert Huth gives away a free kick for an unfair challenge on Roman Pavlyuchenko. Free kick crossed left-footed by Rafael Van der Vaart from right wing, Glenn Whelan makes a clearance. 48:19 Shot from just outside the box by Jake Livermore misses to the left of the target. 47:58 Rafael Van der Vaart decides to take the corner short. 46:42 Rafael Van der Vaart produces a right-footed shot from just outside the area that goes wide left of the goal. 46:00 Rafael Van der Vaart decides to take a short corner. 45:00+1:34 The referee blows for half time. 45:00+1:02 Matthew Etherington has an effort at goal from long distance that misses to the right of the target. 44:50 Cameron Jerome is flagged offside by the assistant referee. Younes Kaboul takes the indirect free kick. 44:08 Roman Pavlyuchenko crosses the ball, Effort on goal by Thomas Carroll from just inside the area clears the bar. 43:08 The ball is crossed by Matthew Etherington, Younes Kaboul makes a clearance. 41:23 Raniere Sandro takes a shot. Save made by Thomas Sorensen. 37:24 Cameron Jerome concedes a free kick for a foul on Raniere Sandro. Free kick taken by Younes Kaboul. 36:39 Inswinging corner taken by Matthew Etherington, clearance made by Younes Kaboul. 35:47 The referee blows for offside. Free kick taken by Thomas Sorensen. 35:20 Cameron Jerome challenges Younes Kaboul unfairly and gives away a free kick. Heurelho Gomes restarts play with the free kick. 32:22 Matthew Etherington sends in a cross. 29:30 Vedran Corluka crosses the ball, Ryan Shotton manages to make a clearance. 27:28 Corner taken short by Rafael Van der Vaart. 25:42 Effort on goal by Glenn Whelan from 20 yards. Jake Livermore gets a block in. 22:44 Rafael Van der Vaart has an effort at goal. Robert Huth gets a block in. 21:05 Jermaine Pennant delivers the ball, Sebastien Bassong manages to make a clearance. 11:35 Inswinging corner taken by Matthew Etherington from the right by-line played to the near post, Close range header by Robert Huth goes over the bar. 11:35 Substitution Peter Crouch joins the action as a substitute, replacing Kenwyne Jones. 9:11 Jermaine Pennant produces a cross, Benoit Assou-Ekotto gets a block in. 7:51 Ryan Shotton challenges Roman Pavlyuchenko unfairly and gives away a free kick. Strike on goal comes in from Rafael Van der Vaart from the free kick. 6:38 Free kick awarded for an unfair challenge on Benoit Assou-Ekotto by Jermaine Pennant. Direct free kick taken by Heurelho Gomes. 6:08 The assistant referee signals for offside against Roman Pavlyuchenko. Indirect free kick taken by Matthew Upson. 5:21 The ball is crossed by Matthew Etherington, clearance made by Jake Livermore. 4:46 Corner taken right-footed by Jermaine Pennant from the left by-line to the near post, clearance by Vedran Corluka. 3:21 Unfair challenge on Rafael Van der Vaart by Wilson Palacios results in a free kick. Free kick taken by Rafael Van der Vaart. 0:58 Unfair challenge on Rafael Van der Vaart by Jermaine Pennant results in a free kick. Direct free kick taken by Rafael Van der Vaart.